Ford had nearly given up on Mercury, along with Edsel, by 1960. The 1961 cars no longer had Mercury bodies but were glorified Fords again, as they had been prior to 1957. But as time went on, sales of middle-class large cars recovered, and Ford Motor Company began planning a new Mercury that was more than a rebadged Ford but less than the entirely separate body of 1957-60. In fact, Ford was simply now doing what competitors Chrysler and GM had been doing for years: sharing major unseen components with different make and size vehicles to reduce costs. A lot of money was spent on the engineering of the all-new Ford and Mercury cars that were introduced six months after the highly popular Mustang increased floor traffic at dealerships. Alas, Mercury sales stayed in ninth place in 1965, but overall sales increased by some 15 percent. The 1965 Mercury Monterey went up in size, and remained the best selling big Mercury for 1965. The new chiseled look was deemed attractive, and a Lincoln-like grille was very popular. A 390 cid V-8 engine was standard with 250 hp, more than adequate for all but high performance speed work. Higher powered 390s of 300 and 390 hp were optional, plus a 427 engine of 425 hp was also technically available but rare. An all-new perimeter frame allowed a lower roofline yet increased room inside and gave a lower center of gravity. Suspension was all-new, and the ride quality and NVH (noise-vibration-harshness) was attended to particularly well, making for serene cruising. All new bodies utilized curved side glass for the first time in a Mercury. The cars also lent themselves as the basis for all-new Canadian built Mercury Meteor cars, which were available with six-cylinder and small V-8 engines, and which used Ford interiors and instrument panels. 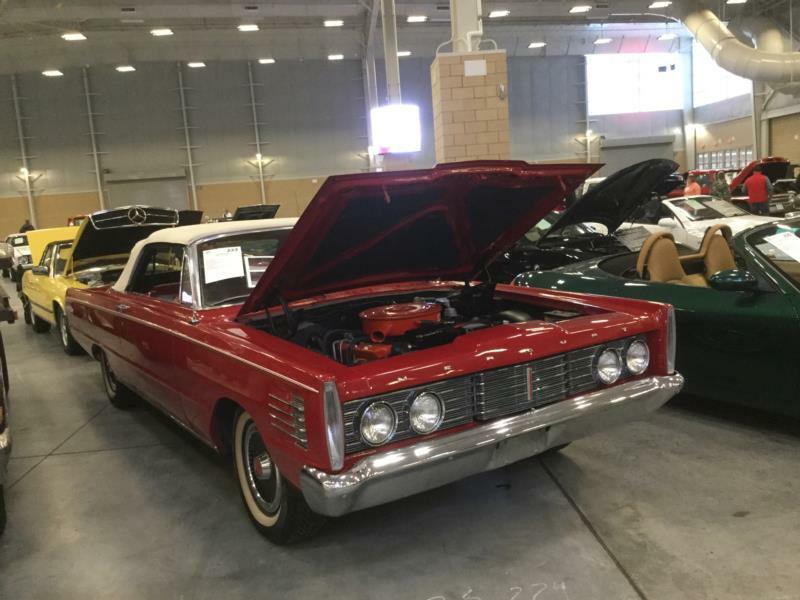 The 1966 cars were facelifted, with the biggest change under the hood being a new optional, lower cost 428 V-8 engine of 345 hp and 410 cid V-8 of 330 hp replacing the 427. The most powerful 390 engine was now 275 hp, which was standard on automatic transmission cars, and a detuned 265 hp version was standard on manual shift cars. Most buyers opted for automatics. Body styles for the Monterey again included Breezeway four-door sedan, two-door sedan, four-door sedan, convertible, fastback hardtop coupe and a new fastback hardtop sedan was added. For 1967, the full-sized Mercury Monterey was restyled yet again. A new grille that returned to the “Lincoln look” was employed, and the base 390 V-8 now produced 270 hp, with a 330 hp 410 V-8 optional alongside a 345 hp 428 V-8. Hot looking S-55 fastbacks and convertibles joined the fray as a sub-series of Monterey this year, and these cars came equipped with the 428 V8 standard. Deeming the performance angle no longer suitable for Mercury’s big cars, this package was discontinued early in the model year, making S-55’s quite rare. For 1968, the car line was merely facelifted, with the loss of the reverse-window Breezeway body being the biggest news. Mercury was a solid hit for Ford during this time, and people who liked Ford engineering, but could not afford the luxury Lincoln, relished in the idea that they had a “junior Lincoln” with plenty of road presence, available to them for not much more than a plebian Ford. The other benefit was that any Ford or Lincoln-Mercury dealer could service the car, and this meant every small town in the country and virtually everywhere in Canada, too.